Dhaka, 3 Dec, Abnews: Drinking enough water can support skin, muscle, and joint health. Water helps the body's cells absorb nutrients and fight infections. Drinking a few glasses of warm or hot water each day might offer even more benefits. Although there is little scientific research on the benefits of drinking hot water, alternative health advocates argue that hot water is an easy way to improve health. In this article, we look at the evidence. While drinking water of any temperature can support overall wellbeing, drinking hot water is thought to provide a range of additional health benefits. People have consumed hot drinks for thousands of years. Folk medical literature is filled with stories of how hot water can improve health, but researchers have only just begun to look into the benefits of drinking hot water. This article looks at eight of the potential benefits and the theories behind them. When a person does not drink enough water, the small intestine absorbs most of the water consumed through food and drinking. This causes dehydration and can make it more difficult to have a bowel movement. Chronic dehydration can cause corresponding chronic constipation. This constipation can make bowel movements painful and may cause other problems, including hemorrhoids and bloating. Drinking hot water helps to break down food faster than drinking cold or warm water. It reduces the risk of constipation by supporting regular bowel movements. Natural health advocates argue that hot water might help the body detoxify. When water is hot enough to raise a person's body temperature, it can cause sweating. Sweating expels toxins and can help clean the pores. Hot water is a vasodilator, meaning it expands the blood vessels, improving circulation. This can help muscles relax and reduce pain. Although no studies have directly linked hot water to sustained improvements in circulation, even brief improvements in circulation can support better blood flow to muscles and organs. Research has long supported the idea that drinking more water can help a person lose weight. This may partially be because drinking water increases feelings of fullness. Water also helps the body absorb nutrients, and it flushes out waste. A study published in 2003 found that switching from drinking cold water to hot water could increase weight loss. Researchers found that drinking 500 ml of water before a meal increased metabolism by 30 percent. Raising water temperature to 98.6 degrees accounted for 40 percent of the increase in metabolism. This metabolic step-up lasted for 30-40 minutes, following water consumption. Hot water improves circulation and may also improve blood flow, particularly to injured muscles. No research has directly linked hot water consumption to pain relief. However, people routinely use heat packs and hot water bottles to reduce pain. Consuming hot water may offer some internal pain relief, but it is important to note that heat can also exacerbate swelling. Heat applied to the sinuses can alleviate pressure caused by colds and nasal allergies. Steam also helps unclog the sinuses. Drinking hot water may help mucous move more quickly. This means that drinking hot water may encourage coughing and nose-blowing to be more productive. When mixed with coffee or tea, hot water may offer additional health benefits. Coffee and caffeinated teas can dehydrate the body, especially at high doses, but they also offer some health benefits in moderation. Research published in 2017 linked coffee consumption to a longer life. Other research has found a link between moderate coffee consumption and a reduced risk of Parkinson's disease, some cancers, type 2 diabetes, some liver disease, and heart health problems. Tea may reduce the risk of stroke, heart disease, type 2 diabetes, and liver disease. Some studies have linked tea to a reduced risk of cancer, but the results vary. A soothing cup of hot water may help people manage stress and anxiety. An older study found that consumption of hot liquids, such as tea and coffee, could lower stress and reduce feelings of anxiety. The study argues that some of the effects are due to caffeine, but that the warmth also played a role in the improved mood of participants. 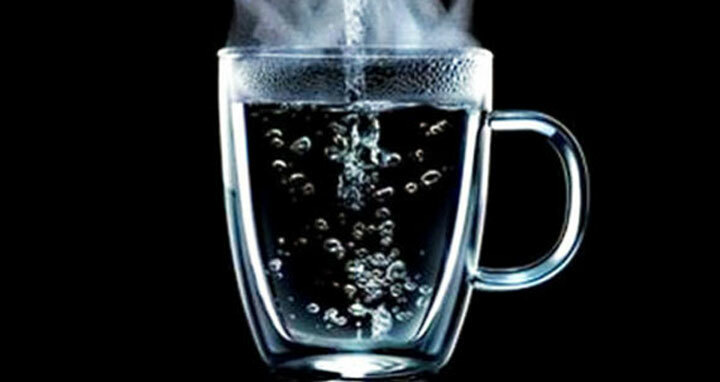 The primary risk of drinking hot water is one of being burned. Water that feels pleasantly warm on the tip of a finger may still burn the tongue or throat. A person should avoid consuming water that is near boiling temperature, and they should always test a small sip before taking a gulp. Drinking hot water in a covered, insulated cup can reduce the risk of spilling the water and getting burned. Drinking caffeinated coffee or tea may cause a person to become overcaffeinated or jittery. A person can prevent this by limiting the cups of coffee or tea they consume, or replacing caffeinated drinks with plain hot water. Hot beverages, such as coffee or tea, are often served at near-boiling temperatures. It is not necessary for a person to risk a burn to gain the benefits of hot water. People who dislike hot water should consider drinking water at or slightly above body temperature. Drinking hot water will not cure any diseases but, as long as the water is not scalding, the risks are minimal. So people who already enjoy hot water or who want to try a simple method for improving their health should feel assured that they are benefitting from it.